The City Council rolled the dice in taxing Seattle's largest employers. But the social problem it claims the tax would help "solve" has much more than economic roots. Last Sunday, I wrote that a jobs tax on large employers would both put Seattle’s competitiveness at risk and potentially hurt the income stream that allowed City Hall to spend ever-growing amounts on social services. The City Council passed it 9-0, albeit at $275 per employee annually, rather than $500, on companies that gross at least $20 million a year. It will take time to assess the economic effects. At best, Seattle’s attractiveness to employers will continue to outweigh the hostility toward business from a majority on the City Council. Yes, passage will further embolden those council members. But the tipping point where their policies actively damage the city’s economy will be pushed into the future. Of course, it’s impossible to prove how many jobs might have been created, the investment that might have been made, if not for the jobs tax. But the momentum here might be so great that the economy will continue growing. Or Seattle might see the reckoning arrive soon. Amazon, which was made out as the villain by jobs-tax advocates, said it would go ahead with a 17-story tower, but continue to weigh whether to occupy the landmark Rainier Square skyscraper now being built. Amazon is also accelerating job creation outside Seattle. And the HQ2 announcement of a second headquarters in a “business friendly” locale is coming. I suspect the consequences will be marginal at first, and then gather speed. After all, this new, additional tax hits 585 companies. They range from wholesale trade to transportation. The most vulnerable don’t have the pricing power to absorb the new levy without severe damage to their profitability. They may close or move slowly, quietly, not all at once. The slow-moving but generally pragmatic center-left that governed for years has collapsed. The GOP’s shift to a hard-right party, pushing out centrists and liberals as RINOs (Republicans In Name Only) left Seattle without a viable opposition. Plenty of Seattleites were angry over the jobs tax. But what options will they have in the next election? The electoral infrastructure of a centrist opposition doesn’t exist. Mayor Jenny Durkan, who was rolled by the Council on the tax, was supposed to be a revival of the old Seattle centrist leadership. Apparently not. One consequence is that the activist elite can frame the issues. For example, many distinct human conditions are lumped into the term “homeless.” This is as politically profitable for the left as “death tax” (estate tax) is for the right. It implies that all these folks need is a home. It would be inhumane to deny them. Another example: “Homelessness” is a direct result of Seattle’s business success and population growth. The implication is that this problem can be “solved” by spending more money, especially on “affordable” housing (translation, heavily subsidized housing, often for people who won’t or can’t work). Go down this rabbit hole and Seattle is a supreme victim of rapacious capitalism. Worse than Youngstown, Ohio, or Detroit! In the reality-based world, Seattle is one of the most successful places in the nation. It is among the big cities with the fewest people living in “distressed ZIP codes.” The diverse economy offers a large number of job opportunities, not just for techies. And for all the real and imputed sins of Big Tech, it’s here to stay unless liberals win many national elections. Seattle is far better positioned at the top of the pyramid than being a city begging for back-office, warehouse and data-center jobs. 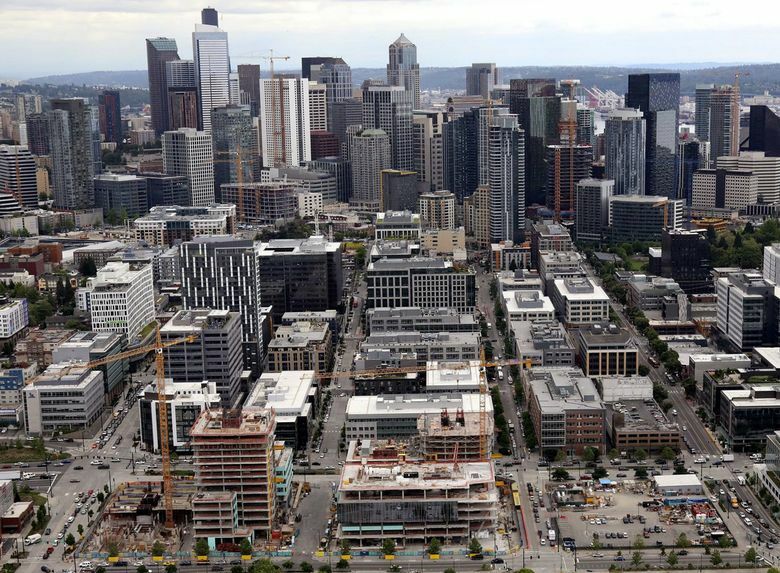 With limited land and high demand, Seattle is becoming a very expensive city. A Goldilocks situation would be nice, although housing affordability is a nationwide problem. Leading cities are pricey. Despite that, they keep leading the world economy and maintaining their desirability for those who can afford them. Seattle’s prosperity allowed public spending to increase substantially. It provided the ballast for such progressive initiatives as the $15-an-hour minimum wage with minimal (so far) negative effects. But really zapping “big business” — meaning the foundation of the entire economy — and growth will hurt the last and the least, not return Seattle to 1985. Meanwhile, Seattle and King County spent nearly $196 million on homeless service programs in 2017. This is a huge increase over the past several years — and yet the numbers of unsheltered and people sleeping on the streets keep rising dramatically. In the framing of the left, this is almost entirely the result of rising rents and house prices, goosed by the high-paying jobs being created here. Yet I’m suspicious of the self-reported numbers claiming that 70 percent of the unsheltered are “from” King County. The social-service providers that profit from growing public spending have every incentive to peddle this narrative. We do know that Seattle’s programs were criticized by an independent report in 2016 for their ineffectiveness and lack of accountability. When we say “homeless,” we mean working people who lost a job or faced a ruinous financial emergency. But the term also encompasses the mentally ill, addicts and the oppositional lifestyle cohort once called hobos. Each condition requires a spectrum of different responses. The last group doesn’t want what most people would consider a home, much less a job. They do find a tolerant city with generous people, abundant services, a stood-down police force, legal pot and decent weather most inviting. Just as no wall prevents companies and workers from coming and going, no wall keeps a mobile unsheltered population from coming here — and in greater numbers if no-strings Freeattle is guaranteed on the taxpayers’ tab. It doesn’t take ESP to predict the City Council will soon be asking for yet more money to address its self-inflicted “crisis.” How long the productive economy can keep up is an open question.